At the annual summit of S. C. Johnson this year, their staff across entire Europe gathered to attend various talks and seminars. The event spread over 5 days consisted of several seminars talking place on the same day, and at times many taking place simultaneously. To organize and communicate this information, along with introducing the user to the new country, creating an agenda application for mobile phone was the most viable option. This iPhone application can be downloaded by any of the attendees at this summit. The users would be an SC Johnson employee or sales agent who would come from all over Europe. Rather than just showing a calendar on the screen, an innovative information hierarchy was created based on how the application would be used. A large area of the homescreen was dedicated to the upcoming events to keep the user on track and updated as that would be the most used feature. Further the flow of the information was chalked down. The application needed to be simple to use with minimum levels of information. 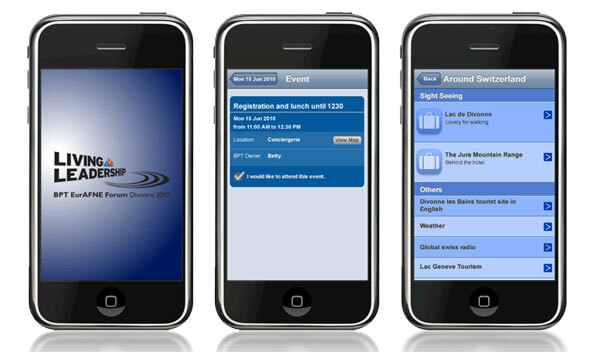 The user can choose the events he is interested in attending and the reminders for them are set automatically. Other features include weather information, hotel information, travel information, interactive maps, emergency contact information, etc. For S. C. Johnson's annual summit in Divonne, Switzerland, the client (Rapid Value solutions.) required a solution to help it's staff attend the various events, plan their stay and travel around Switzerland with minimum effort and utmost ease. 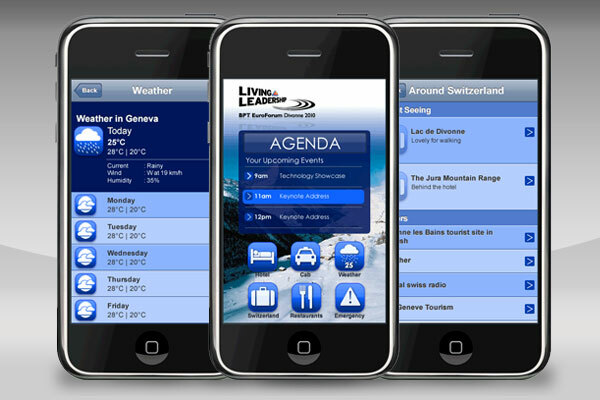 An iPhone application would allow easy updation and planning. The most important task was to assist the user to attend the selected events and talks at the various venues on time and give reminders to help him plan his day.